Scattered, Suspended, and Tough, Tough, Tough!! This morning I welcomed back John M. and his 14 year old son, Matthew, as well as “Grandpa” Al. 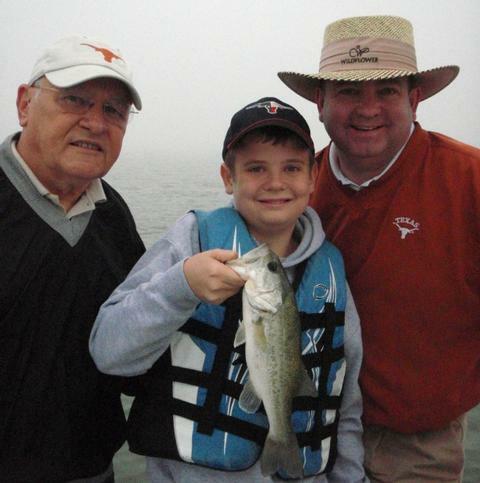 From L to R – Grandpa Al, Matthew, and John with our first fish of the day taken on a crankbait as we were still socked in by fog. Long story short, we struggled today to get to what Matthew fondly referred to as “double digits” — we boated only 10 fish this morning and struggled to do even that. Stillhouse has been a tough nut to crack ever since the 10+ feet of flood water came down hard from out of the Lampasas River. I have had a hard time locating bait and gamefish since this big rise. There is a definite stratification of the water column over the entire length of the lake. Around 25 to 35 feet there is a very distinctive band of “something” that shows very definitively on sonar. I don’t know if it is unsettled silt, water of a certain temperature, some manner of insect or small freshwater shrimp, or what, but it is there and I haven’t seen any fish marked in that layer or below it for 7 days now. We pushed off at 7:15a in a heavy fog, relying solely on GPS to get around. We first hit Area 1062 and just to the west of it, but along the same 12-14 foot breakline, boating a just keeper largemouth, followed by 2 white bass. I thought we might encounter the same scenario we did last night as the skies slowly brightened wherein fish stacked up along this breakline, at first in one-sies and two-sies, then began to coalesce into larger schools of 1-3 dozen fish or so. 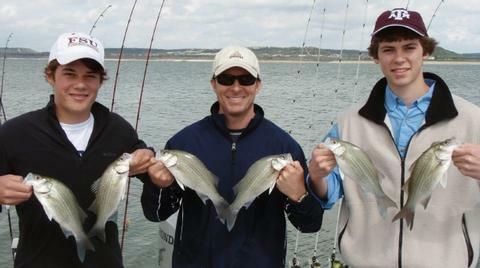 We continued to flatline troll for the fish we saw on sonar and picked up 3 more white bass here. We saw one decent cluster of fish, e-anchored on them cast to them with bladebaits, but to no avail. When the second fish to hit Matthew’s rod struck, he was right in the middle of eating some snacks. He had a handful of chips in one hand, palm up, and was using his other hand to feed himself. When that fish hit, he shoved the entire handful of snacks into to mouth and grabbed that rod in less than a nanosecond. His dad saw the same thing I did and was in stitches about Matthew’s reaction. Adrenaline is a good thing!! Afterwhile we left this area and headed to Area 1064/5. 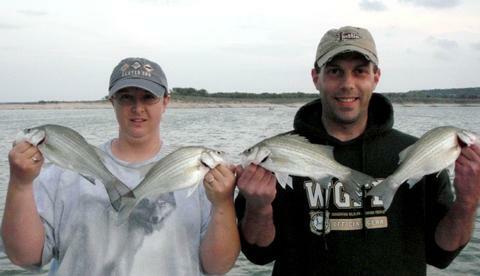 We picked up one white bass here on the flatlined Wiggle Wart and found nothing else. We then headed over to the Area 125-770 Complex and downrigged a pair of white bass with staggered downrigger balls at 17 and 19 feet. After this played out and showed now sign of producing abundant fish, we continued searching several areas, all to no avail. We spent our last hour scrubbing the water from Area 1043 to Area 056 with downriggers set between 16 and 21 feet (varying the depth as fish location dictated); in review, everything we caught we found in less than 21 feet of water. We landed one more pair of white bass in quick succession to the SW of Area 1043 and that was all she wrote. I complimented Matthew after our trip for hanging tough when the fishing was difficult. He never got down, discouraged, whiny; rather, he looked forward to each new spot we went to and each new technique we tried as we shot for that “double digit” goal of his! Simply put the fish are scattered, off their feed, and very difficult to pattern. I noted to the fellows as we took a few photos of the fish we caught that the white bass were all defecating brown/black feces which indicates that they are feeding heavily on insects. 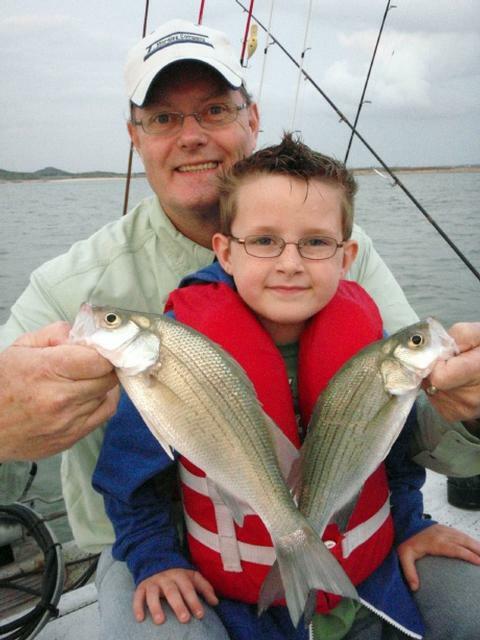 99% of the time white bass feces are silver/grey from the digested shad they typically consume. Only time can settle things down if no hard rains come along. Looks like we’ll be turning our sights on Belton Lake at least for a while during the forthcoming annual shad spawn there. Air Temp: 66F at trip’s start. Wind: Winds were S12 in the fog, settling back to SSE8 as the skies cleared. Skies: Skies were foggy until 8:30, then cleared to fair and cloudless. This afternoon I met up Dimitri and Eric, old rock band buddies now separated by the miles, who came together for a long weekend to fish, camp, hike, and catch up with one another. L to R — Eric hangs onto a largemouth that slammed his bladebait as we fished a mid-depth flat for white bass, as Dimitri grips a nice white crappie that fell for a crankbait early in our trip. The majority of our catch tonight (22 of 26 fish) were white bass. Here Dimitri shows the largest of them taken on a blade bait in 12-14 feet of water. Based on my scouting success from the evening before, I had a strong suspicion that we’d be spending most of our time in and around Area 1064 trolling to find fish, buoying them, and then saturating the area with casts to take advantage of the evidence we’d discovered by way of trolling. With this in mind, before we even left the ramp area, I coached both fellows on the use of the spinning gear we’d be using, and the right technique for working the bladebaits I had tied on for this job. After that, we hit a few areas quickly by flatline trolling and came up with only one crappie that way. I told the fellows before we launched that afternoon trips typically start slowly with action building towards sunset and that is what we experienced today. Around 5:30p I moved us to the vicinity of Area 1064 and we began combing the breakline here while constantly monitoring sonar. Soon we were into fish by flatline trolling, then, as the action began to steadily build, we went from seeing single fish or fish in groups of 2-4 fish to seeing schools ranging from a dozen to 2 or 3 dozen fish each. When this occurred, we left the trolling behind, placed a buoy near the marked fish and then cast to these fish over and over again until we’d ferreted out all of the active fish in the school. We’d then locate another bunch by trolling and repeat the process, eventually putting together a decent catch of 26 fish given the tremendous environmental changes the lake has undergone in rising over 10+ feet in a short span of time. Now about that “Chalk Me, Baby!” title to this blog entry … well, first you need to know that Dimitri drives an old Subaru station wagon which he unceremoniously painted flat black. As I met him and Eric in the parking lot, we shook hands and I motioned for them to follow me to the water’s edge for casting lessons. Dimitri made a few steps to follow, then paused and headed back to his car indicating he’d forgotten something. It was then that he emerged with 3 very large pieces of chalk and wrote “Chalk me!” on his vehicle’s flat black hood then left the chalk pieces resting on his driver’s side windshield wiper. Later, when I inquired about that practice, Dimitri informed me that this is something he’s accustomed to doing in Austin (the city with the unofficial motto which reads “Keep Austin Weird”). Evidently, when you leave such a message on your car, you give license to anyone who wishes to leave a message, artwork, advertisement, etc. to do so. Naturally, I had to ask about the most memorable of the chalk messages he’s received over the years. His responses would be rated “PG” at best and will not be herein disclosed! After our trip the two men headed off to camp overnight in the Union Grove campground with plans to hike and explore along the Lampasas River the following day and to dine on various “pliable” foods that could be crammed into a flour tortilla shell. TALLY = 26 fish, all caught and released. Wind: Winds were S7-8 . Skies: Skies were cloudless and fair. This morning I took returning guest Mike B. of the Dallas area out along with his friend’s 16 year old son, Zan, and Zan’s buddy, John, who is also 16. L to R — Zan, Mike, and John wore ’em out this morning on bladebaits used both vertically and horizontally. Zan and John first became friends several years ago through a Christian organization called Young Life, which, to their credit, they continue to participate in today. Someday they’ll realize that time spent was actually not an expenditure but an investment. This morning we were very fortunate. We got on fish and stayed on fish on a Spring Break Saturday with reasonably nice weather and all the heavy boat traffic which that combination brought with it. I put us on the water a bit earlier than during my past 9 weekday trips this week so we were sure to get to where the fish were and avoid having them run over by boat after boat thus scattering them or making them turn off. We found two significant congregations of fish. The first was located at Area 103. We found these fish by flatline trolling, seeing them on sonar, checking their willingness to bite by seeing if the flatlined crankbaits got bit, and then returning to and hovering near those fish which turn out to be cooperative and working them over with bladebaits. At our first such scenario we managed to boat 39 fish after picking up 2 on the troll. We found a few fish where we’d picked them up and then found as we caught fish, we drew the fish in closer and closer to the boat as curious schoolmates followed hooked schoolmates in towards us until finally we were essentially vertical jigging with the bladebaits due to the great number of fish right beneath the boat. When Area 103 fizzled, we got back on the flatline routine and again located a solid school of fish, this time between Areas 1056 and 746. These fish were a bit deeper so I hovered us more directly over top of them to start with. We slowly “smoked” bladebaits to catch these fish, as well as used 3/8 oz. white or chartreuse TNT180 slabs to pluck them off bottom. We boated another 29 fish here until the bite died to near nothing. By now it was 11:15. We’d just seen nearly 4 hours of non-stop action but I thought I’d at least look over a few more areas in deeper water just to see if the fishing had shifted or stopped altogether. At Area 1057 we slabbed heavier 3/4 oz. 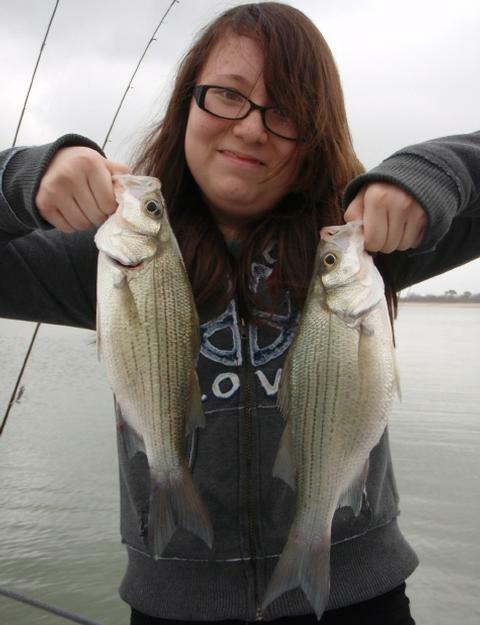 slabs for just 3 more white bass after finding nothing as several other areas. With skies clearing, winds getting stiff and the bite now all but dead, we called it a day and headed to the dock. I would be remiss if I did not mention “just the facts” connected to a particular fishing incident which occurred during this otherwise fantastic trip. As we moved from Area 103 to Area 1056, I took my eyes off of sonar just momentarily and observed John poking at a silver/grey “squiggle” of something adhering to the port side of the boat. I smiled and asked, “Do you know what that is?”. He looked back at me and said, “No.” I said, “That’s fish poop.” He jerked his hand away from the squiggle very quickly, but not before his best pals Mike and Zan were all over him threatening blackmail, embarrassing photos, and the like for several years to come. They were just merciless. John, I’m sorry this all had to be revealed in such a manner – I really don’t think they’ll tell your future wife about this like they said they would! This was a great trip with a great bunch of fellows. TALLY = 73 fish, all caught and released. Wind: Winds were S7-8 increasing to S12-13 by trip’s end. Skies: Skies were 100% overcast. This evening I fished with Jeremy and Paula C., both from the Cheyenne, Wyoming area. Jeremy and Paula are a really nice couple, married 15 years. They enjoy the outdoors together in a number of ways including fishing (mainly in creeks and rivers), bowhunting, and working with their 5 dogs. It is their love of dogs that brought them here to Texas. Jeremy drove Paula 800+ miles to drop her off at a canine handlers’ course in Florence, TX, where she’ll gain the skills and qualifications necessary to train all manner of working dogs. Jeremy works in industrial refrigeration repair and needed a little break, so, while they were down this way, they chose to pursue a species of fish they’d never before had the opportunity to catch. Our deep bite (which I’ve been counting on all week on my afternoon trips) definitely got softer as the week went by and the water warmed. We started our day off checking out quite a number of deeper 30-45 foot areas, only to find small schools of fish occupying these areas. We found 5 fish at Area 986 and moved for lack of additional action. Same thing at Area 1063 (5 fish), and Area 1027 (6 fish). So, we headed shallower earlier than I had headed shallow all week and while the skies were still bright with direct sun (around 5:45p). We headed first to Area 103 and found fish loosely schooled together here in 17-20 feet of water. I buoyed them, backed off a cast’s length, and we worked them over with bladebaits, boating 34 white bass, 1 crappie, and 1 drum in about 90 minutes time. These fish responded best to a horizontal retrieve, but, on occasion hit a vertically smoked bait. After this school dissipated, we found 2 other tightly bunched schools of white bass in 12-14 feet of water, but they were on the move. We stuck with a flatline trolling regimen to try to intersect with these moving schools for our last 30 minutes on the water or so and did manage to boat 5 more white bass on trolled Wiggle Warts. Good luck to you as you go “back to school” Paula. I hope your hairy students are all cooperative!! TALLY = 44 fish, all caught and released. Wind: Winds were S14-16, tapering to S11-12. Skies: Skies were partly cloudy. This morning I took teenaged fishing buddies Taylor and Matt of the Austin area out fishing in a belated celebration of Taylor’s most recent birthday. From L to R — Matt, me, and Taylor back at the boat ramp as we showed Taylor’s mom, Elizabeth, the best 4 of the 55 fish we’d boated today. Thanks for the camerawork, Marty!! This trip came on the second re-schedule following two previous Saturday rain-outs. This time, the weather was just right — cloudy, breezy, warm, and humid. 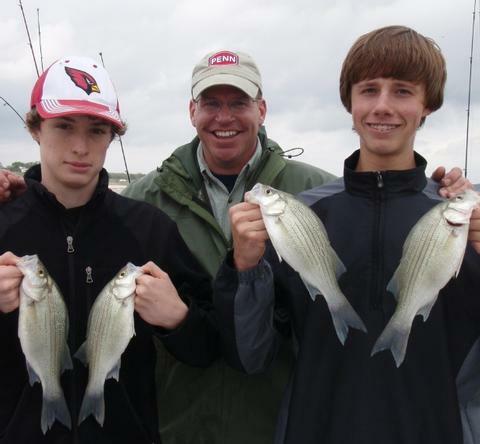 Taylor and Matt have fished with me twice before, once in the summer and once in the fall, so I got to introduce them to the use of bladebaits which really shine as a white bass producer in the spring time when fish are shallow and aggressive. We began our day up shallow at Area 1056. Using only the bladebaits, we boated 35 fish over the first two hour plus. The fishing was moderately paced and consistent. Next, after seeing some nearby tern action, we moved even shallower over to Area 1060 where we found white bass so aggressive they were popping shad at and on the surface. We fancast this area and boated another 10 fish here before the wind died down a bit and caused the action to slow, as well. During this slow time of light winds, we put out flatlined crankbaits and trolled. We found fish on and around Area 055, and caught 2 on the crankbaits, but never pinned down enough concentrated fish to stop and cast to. Our final hour plus was spent along the river channel at Area 1034/1058. 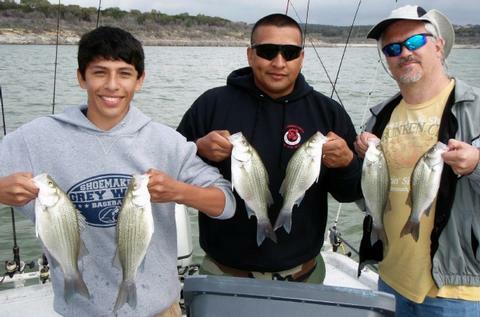 We found loosely schooled fish here consisting of white bass with some drum mixed in. These fish were sluggish as the morning bite was about to be over. We initially tried vertical jigging and got a few fish to respond, but they shut down right away. The fish would not respond to an easing tactic, either. Finally, we hooked up the downriggers and, using twin White Willow Spoons, passed over the concentrations of fish we saw on sonar over and over again. Each pass we picked up at least one fish until, after taking a total of 8 fish off this area, they dispersed and we called it a day. On this outing we were fortunate to be accompanied by Marty and Kyle Wall. They captured video clips throughout the trips to help piece together some visual products aimed at getting the word out about fishing trip I offer, especially those trips conducted free of charge for the children and youth of our deployed servicemen and women. TALLY = 55 fish, all caught and released. Wind: Winds were S6-7 increasing to S10-11 by trip’s end. Skies: Skies were 100% overcast.. 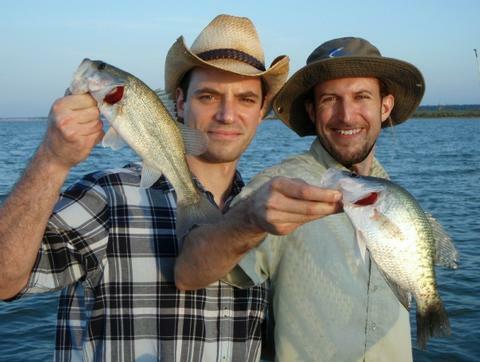 This evening I fished with Steve N. of Temple (a.k.a. “Baboo”) and his nearly 7 year old grandson, Caleb (the one who calls Steve Baboo). Steve and Caleb display the best of 45 fish we hunted down from deep to shallow today using a variety of tactics. Steve, a Temple CPA, and Caleb have been out with me on a number of occasions. It is neat to see how, over the years, Caleb has matured. On our first trip a few years back his attention span, as I recall, could be measured in minutes, but, today he stayed on task the whole time independently landing a number of fish with no assistance whatsoever. His manners, too, were more polished with “Yes, sir.” and “Thank you.” a very regular part of his vocabulary. To his credit, Steve brought lots of snacks just in case of temporary attention deficits!! As we got going today, we began our afternoon trip right where we’d concluded the morning’s trip, at Area 1034/1058. Again, we found fish here but they were very sluggish. They responded only to our first attempt at vertical jigging, then turned off not to become interested again. We boated just 4 fish here and had to move on. We dropped down into deeper waters this time and pulled 21 fish off of area 1043 in ~38 feet of water. These all came on TNT 180 slabs in silver, white, and a silver/white combination — all worked equally well. I really had to search hard for these fish and there wasn’t as many in this general area as there has been all this winter. I believe this area is playing out given the rising water level, water temperature, and increasing day length. As I have all week, I moved us shallower as sunset approached so as to be fishing in yet still well-lit water as dark approached. We were fortunate to drive right up on a large school of fish holding near bottom in 20-22 feet of water at Area 103. We set up over top of these fish, I changed out our 3/4 oz. slabs to 3/8 oz. slabs, and we vertically jigged very successfully for the final hour to add exactly 20 more white bass to our count for the trip. As dark neared, Steve and I both clearly noted that the fish fed less effectively and less accurately. It was not uncommon to have a fish strike and miss 3 or 4 times before actually connecting with the slab. I suspect this is because the begin to change from primarily sight feeding to using their lateral line to detect the bait’s position. TALLY = 45 fish, all caught and released. Skies: Skies were partly sunny to mostly cloudy. This evening I fished with Rob R. of Austin, TX, and his 2 boys, Drake and Cameron. 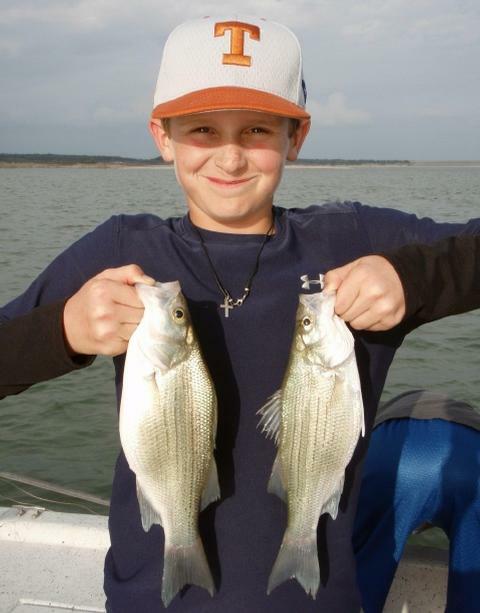 Cameron shows his first white bass that eclipsed the 14 inch mark (on L.), caught on a TNT 180 slab. 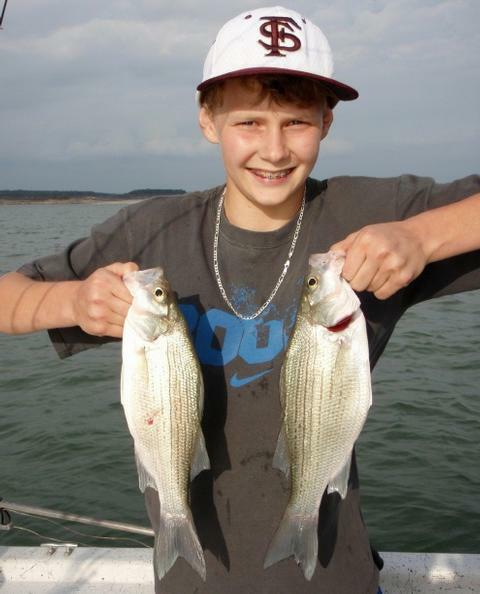 Drake also landed white bass beating the 14 inch mark. These two came out of 42 feet of water. Rob, who works in landscaping and irrigation, has been out with me once before, along with Drake, in July when classic hot water tactics of downrigging and fast smoking were the rule. So, it was nice to have them out again in a different season when different tactics are required so as to expose them to some variety. Although a slow version of smoking is occasionally effective for short periods when fish really turn on, by and large vertical jigging is the most effective technique right now. We made our first stop at Area 1055 where we caught 8 white bass pretty quickly allowing us to work out all the kinks and to get practiced at the techniques we’d be employing for the rest of the trip. Both Rob and Drake hooked up at this area, but Cameron remained fishless. Rob and the boys remained “good-naturedly competitive” throughout the trip, regularly reminding one another that each had caught more than the other, and that each had caught fish bigger than the others. This kept everyone on their toes, engaged and attentive, never wanting to fall behind in the fish count! Next we headed to Area 1042 where we boated 41 white bass from out of ~40-42 feet in open water, all on TNT180 slabs, and all using a straightforward jigging tactic. We stayed on these fish a solid hour and a half before the bite trailed off. Needless to say, Cameron shook the skunk off his back here and, once he got the hang of things, did just fine from that point forward. By now it was around 6pm and the sun was getting lower and obscured by heavy grey clouds. We started fishing in more well-lit, shallower water. We first stopped at Area 519 and put 4 white bass in the boat out of 28 feet of water. We then headed back to Area 1055 where we boated another 11 fish, again, on slabs. As we fished here, the clouds in the west thickened even more, so, by 7:00p, I headed to the shallowest water I’d been encountering fish in thus far this week. In the vicinity of Area 995, we geared up with flatlined crankbaits and put a final 6 fish in the boat trolling slowly and working hard on keeping our baits just above the bottom. By the time we’d finished up we boated a total of 70 fish. TALLY = 70 fish, all caught and released. This morning I fished with “Grandpa” Sam S. of Baytown, TX, U.S. Army Staff Sergeant Johnny I., and his teenaged son, Johnny, a proud Shoemaker High School Greywolf! From L to R — young Johnny, Staff Sergeant Johnny, and Grandpa Sam, with our best 6 of the 135 fish boated today on bladebaits. You may remember the Old Milwaukee beer commercial that showed two fellows on “Bedico Creek” casting crankbaits and catching bass … as the commercial ended the one fisherman says to his buddy, “Let me tell you, it doesn’t get any better than this.” Well, that’s the kind of morning we had this morning. We met at the boat ramp, got to know one another a little bit, then covered some safety basics and some fishing technique basics. Sam is an 8th Grade science teacher near Houston, and Johnny is currently assigned to a Route Clearance unit on Ft. Hood. The unit’s motto is “You Fear ’em; We Clear ’em!” referring to their mission of removing mines, booby traps, and improvised explosive devices from roadways used by our other armed forces. We headed off to Area 995. We did a bit of flatline trolling to try to nail down the location and activity level of white bass in that general area. 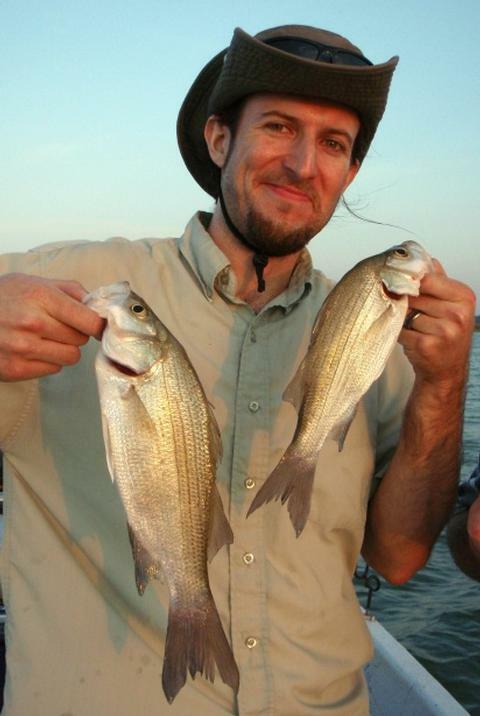 As we motored around, I saw the first topwater feeding white bass of the season, albeit very, very light. Then it happened, we came over an area we’d been over 3 times already, but this time the fish had moved in and moved in big time. I let the boat continue to motor past the fish to avoid shutting it off and making a sound change right near the fish. We got a double hookup on the crankbaits were were trolling, letting me know these fish were ready to feed. Next, I got us positioned within a cast’s length of the large school of fish we’d just encountered and we went to work. We caught fish for 3 1/2 hours straight. The action ebbed and flowed but never stopped as we worked our bladebaits right through these hyperactive pre-spawn white bass. When all was said and done we’d boated exactly 135 fish before the brightening sun finally killed the bite around 11:15. By then it was all over but the picture taking. This was a very productive day definitely aided by the fact that everyone already had a good bit of fishing experience under their belts. TALLY = 135 fish, all caught and released. Wind: Winds were S3 at sunrise with a slowly building S breeze increasing to S7 by trips end. Skies: Skies were 100% overcast but still bright. This morning I drove into Killeen to pick up sisters Patty and Melissa (Missy) L. for the first fishing trip of their lives!! When I asked Patty what she thought of her first fishing trip she said, “It wasn’t as hard as I thought it was going to be.”. When I asked Missy what she thought of her first fishing trip she said, “It was really fun.”. This trip was paid for by a person from the girls’ church, Memorial Baptist Church, in Killeen. 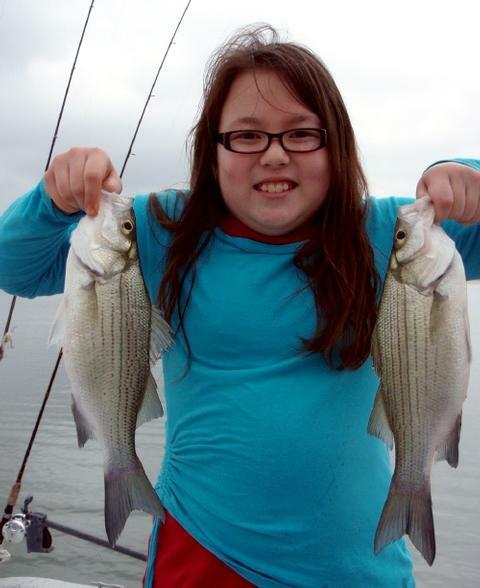 This person learned that the girls had never been fishing before, and wanted to give them that experience. The girls’ dad is raising them alone and is a hard-working fellow with no fishing experience of his own, so, that, coupled with the fact that the girls had no formal plans for Spring Break due to dad’s work schedule, looked like a match made in heaven. Today’s weather was good fishing weather — dreary, grey, warm, and a bit breezy. We found our first batch of fish at Area 995 in about 15 feet of water. We cast bladebaits out horizontally and worked them back over fish we’d located in small groups via sonar after marking them with a buoy. We landed 23 fish here before the action tapered off. Next, we headed to Area 054/602 where 4 terns were working and pointed the way to some very shallow white bass feeding very aggressively on shad. We used lighter bladebaits here and fished them higher in the water column to net 13 more fish. We finished up flatline trolling with Reef Runner Ripshad 200’s to put 11 more fish in the boat before the morning bite died. On the drive back to the girls’ home, I got to enjoy a few tales about what each sister does that gets on the others’ nerves, about where they like to go out to eat when they get the chance, and a bonus tale about dad’s cooking abilities. TALLY = 47 fish, all caught and released. Skies: Skies were heavy grey to the point of occasional drizzle. 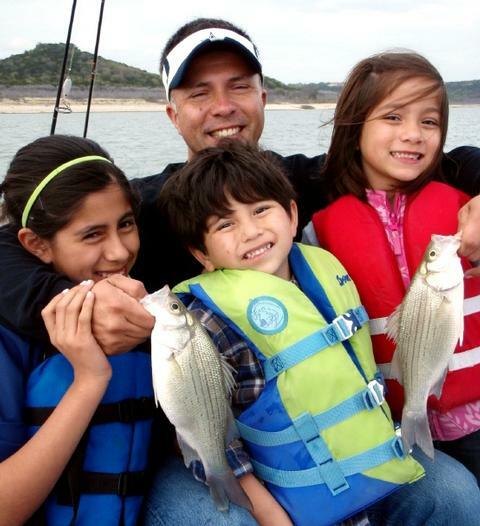 This evening I fished with Raul G. of Harker Heights, TX, and his 3 kids, Lauren, Olivia, and Cristian. One of the last fish we boated this evening was this chunky 18.25″ largemouth bass that slammed one of our crankbaits as we flatline trolled attempting to locate tightly bunched groups of white bass. We caught lots of white bass today both by way of jigging and smoking techniques. 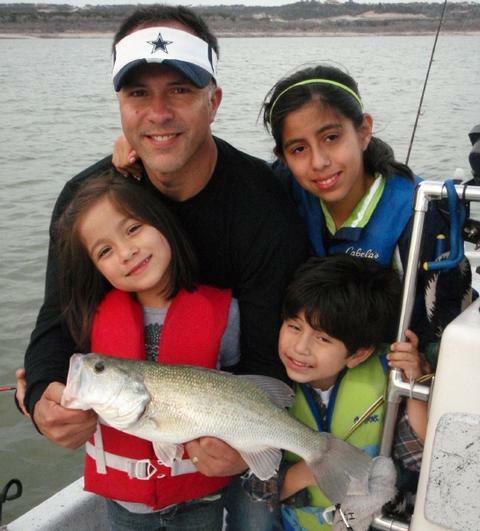 Raul took some vacation time off for Spring Break to spend it with his children and things worked out very well as far as both weather and fish cooperation level were concerned. Just being on the boat was a big thrill for the kids. We made a short stop at Area 074 where we caught 11 white bass in no time, thus allowing for some “instant gratification” and allowing for the kids to get practiced at the techniques we’d be employing for the rest of the trip. Next we headed to Area 1055 where we boated 35 white bass from out of ~37 feet in open water, all on TNT180 slabs, and all using either a jigging or smoking tactic. As sunset approached, the clouds in the west thickened which meant our sunset would be obscured and the fishing would come to an end a bit earlier than normal. We headed to shallower water once this clouding occurred, and fished first at Area 698. We found a few fish on sonar, gave it a try, boated 2 white bass and left after seeing this wasn’t going to materialize into much. We made our final stop at Area 549/103 and put out twin flatlines with Wiggle Warts and RipShad 200’s tied on to work the entire depth range encountered in this area. We made multiple passes here over about a 30 minute span and put a final 6 fish in the boat, including the largest fish of the trip, a nice 18.25 inch largemouth. TALLY = 54 fish, all caught and released.